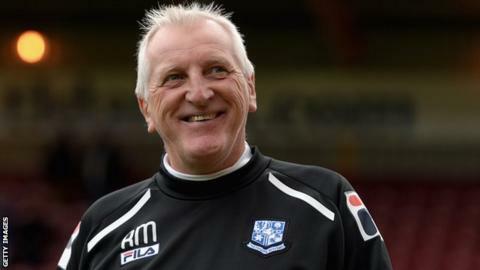 Manager Ronnie Moore wants his Hartlepool United players to take the positives from Saturday's 3-0 defeat by League Two high-flyers Shrewsbury. Pools held the third-placed Shrews to a goalless first-half, but were undone by three goals in 18 second-half minutes. Defeat leaves Moore's side bottom of the table and nine points adrift of Dagenham & Redbridge, who sit one place above them in the relegation zone. "We've said 'don't get your heads down'," Moore told BBC Tees. "We can be negative about the way we conceded the goals, as it was down to sloppy individual errors, but we need to be positive on the way we played in the first-half. "The key is that we learn from it and take that first-half performance into Saturday." The loss to Shrewsbury came after Hartlepool won their first game under Moore's stewardship, beating Cheltenham Town 2-0 at Victoria Park seven days earlier. While former Tranmere, Rotherham and Oldham boss Moore was disappointed to return to losing ways, he said Pools were overcome by a side that should be considered promotion favourites. "It was self-destruct on the goals," Moore said. "But I'm not kidding myself, they're the best side we've played and the way they played in the second-half proved they'll probably win the league." There has been defensive improvement since Moore took over, with five goals conceded in five games prior to the trip to Shropshire. However, Moore remains concerned about the fragility within the squad when pressed as they were by Shrewsbury. "What worries me more than anything is that if we let one in it can be two or three," he said. "There's a lot of young lads in there, some of those lads are inexperienced. "That's why we're where we are, it's the inconsistencies of League Two football."